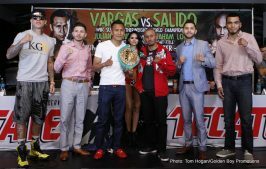 (Photo Credit: Tom Hogan/Golden Boy Promotions) LOS ANGELES (June 2, 2016) – WBC Super Featherweight World Champion Francisco “El Bandido” Vargas (23-0-1, 17 KOs) and former three-time world champion Orlando “Siri” Salido (43-13-3, 30 KOs, 1 NC) today hosted the final press conference ahead of their 12-round showdown Saturday, June 4 at the StubHub Center and televised live on HBO® Boxing AfterDark. They were joined by undefeated Julian “El Camaron” Ramirez (16-0, 8 KOs) and Abraham “Chamaco” Lopez (20-0-1, 15 KOs), who will meet in the ring for the vacant NABA Featherweight Title in the co-main event on June 4. 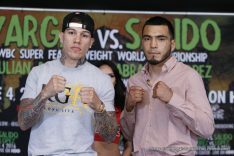 Undercard fighters were also on hand for today’s final press conference including “King”Gabriel Rosado (22-9, 13 KOs) of Philadelphia and Tijuana’s Antonio “Tony” Gutierrez (20-1-1, 9 KOs) who will face off for a 10-round middleweight bout; Christian “Chimpa” Gonzalez (13-0, 12 KOs) of Buena Park, Calif. who will fight for his first title, the WBC Youth Super Featherweight Title in an eight-round bout; Nick Arce (7-0, 6 KOs) who will battle in a six-round super featherweight bout; Jonathan “Thunder” Navarro (5-0, 4 KOs) who is scheduled for a six-round super lightweight bout; Genaro Gamez (1-0, 1 KO) of San Diego who will fight in a four-round lightweight bout; Oscar Duarte (4-0, 2 KOs) of Parral, Mexico who will face off in a four-round lightweight bout; and Cesar Diaz of Palmdale, Calif. who will make his professional debut. “We know that June 4 is nearly here. I know Orlando has trained hard like I have to give the fans a great fight. You definitely do not want to miss this fight. “Thank you to Golden Boy, HBO and the WBC family. I want everyone to know that we respect Salido. He is a great warrior and has been in great fights. We know he will be ready. “This also shows the commitment HBO has to make great fights with Golden Boy. The fans have responded because this is guaranteed to be an action-packed fight. “It’s a real pleasure to be here. This is going to be a war. It’s a tremendous fight. We have a great fighter and a great champion with Orlando Salido. We believe he won the fight against Rocky Martinez. “I’m ready for this fight. I trained hard and I know Abraham did, too. I want to give credit to Abraham for stepping up to take this fight and put his undefeated record on the line. “Here we are at the StubHub Center, home of some of the most epic fights of this era, and on Saturday we will witness two Mexican warriors face-off in the ring as WBC Super Featherweight champion Francisco Vargas makes his first title defense against former three-time world champion Orlando Salido. “We are privileged these fighters stepped up to face each other. StubHub is a great venue for us. It is our 14th time here for a fight. There is something about the energy in the arena here that makes the fighters step up. This fight is a tremendous event. 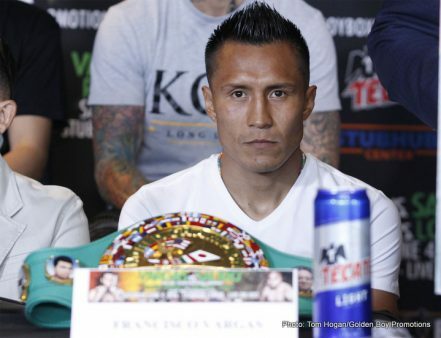 “Vargas is a former Olympian, world champion. He sowed us last November that he has great boxing skills and the ability to pull of a great upset. 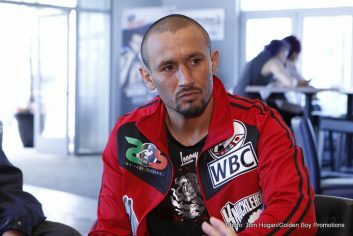 Salido – everyone knows he has been a warrior for a long time. When he was coming up as a young kid, by the time he was 17 he has a record of 18 pro fights. It’s never been a easy road for him but no one is counting him out. “Mexico is a producer of champions and this fight is an example of one where the fighters will give everything for the fans. Boxing needs these kinds of matches. This is the kind of fight the fans appreciate; two warriors in the ring. Tickets for Francisco Vargas vs. Orlando Salido priced at $200, $100, $50 and $25, plus applicable taxes, fees and services charges are available for purchase at AXS.com, by phone at 888-9-AXS-TIX (888-929-7849), and at StubHub Center Box Office (Monday through Friday from 10 a.m. PT to 6 p.m. PT). VIP Suites are available by calling 877-604-8777. For more information on group discounts or VIP packages, call 877-234-8425. Francisco Vargas vs. Orlando Salido is a 12-round battle for the WBC Super Featherweight Championship presented by Golden Boy Promotions in association with Zanfer Promotions and sponsored by Cerveza Tecate, BORN BOLD, Casa Mexico Tequila and HANDS OF STONE: The True Story of Roberto Duran, in theaters this August. The HBO Boxing After Dark telecast begins live at 10:30 p.m. ET/PT. The RingTvLive.com live stream begins at 7:30 p.m. ET/4:30 p.m. PT.